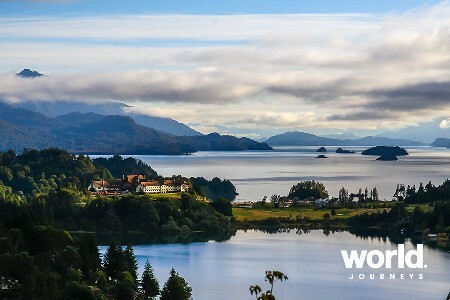 South America is simply magical, overflowing with ancient history and packed with culture. 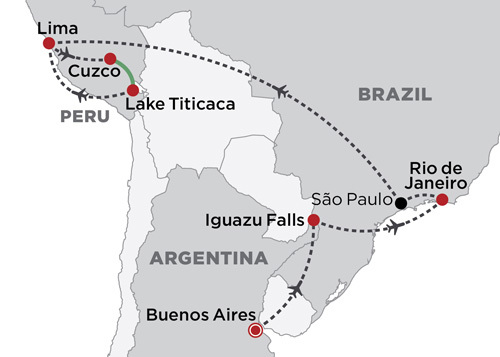 On this journey through Argentina, Peru and Brazil, you'll tick off most of the must see sights. Begin in stylish Buenos Aires with a wonderful tango show, continuing on to the world's most spectacular waterfalls at Iguazu. Beautiful Rio de Janeiro with 'Christ the Redeemer' precedes the rich history and culture found in Peru, including the 'Lost City of the Incas' at Machu Picchu. End your journey with a cruise on the beautifully reflective waters of Lake Titicaca. Day 1: Buenos Aires Arrive in Buenos Aires and transfer to your hotel. Days 2: Buenos Aires Explore Argentina's big, cosmopolitan capital, known for its European atmosphere and passionate tango. Visit colourful La Boca, the Italian quarter and see art vendors and tango dancers before continuing onto the opulent suburbs of Palermo and Recoleta. Here, you will visit the mausoleum of Evita Peron which is situated in the amazing cemetery 'city'. This evening, enjoy a superb dinner and tango show. Day 3: Buenos Aires The day is yours to explore, shop or relax. Perhaps visit the opera house or a take an optional day trip to historic Colonia, situated a one hour ferry ride across the River Plate in Uruguay. Day 4: Buenos Aires > Iguazu Falls Fly to the mighty Iguazu Falls, a natural wonder with more than two hundred cascades thundering over an 80m cliff. Transfer to the Melia Iguazu, your 5 Star hotel situated within the National Park and walking distance from the falls. Days 5: Iguazu Falls Morning guided tour to the famous Devil's Throat cataract on the Argentine side. 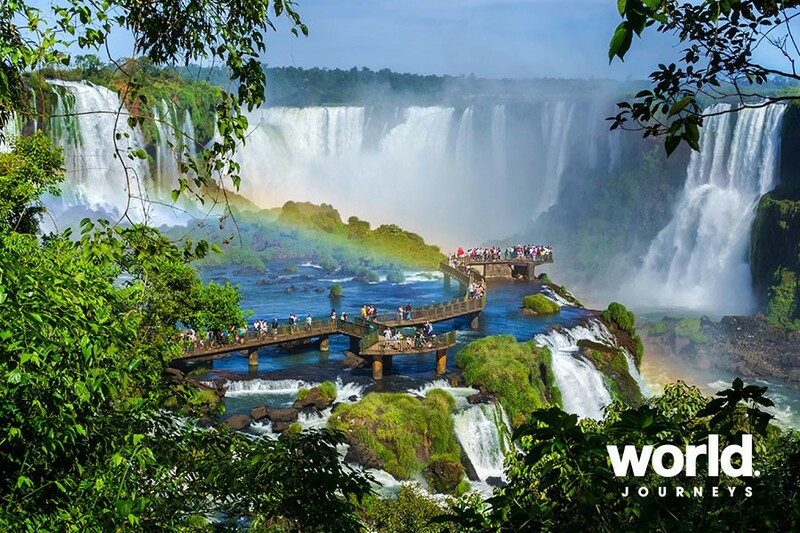 Day 6: Iguazu Falls > Rio de Janeiro Visit the Brazilian side of the falls and see a wonderful wildlife park before flying to Rio. Transfer to your hotel at the famous Copacabana Beach. 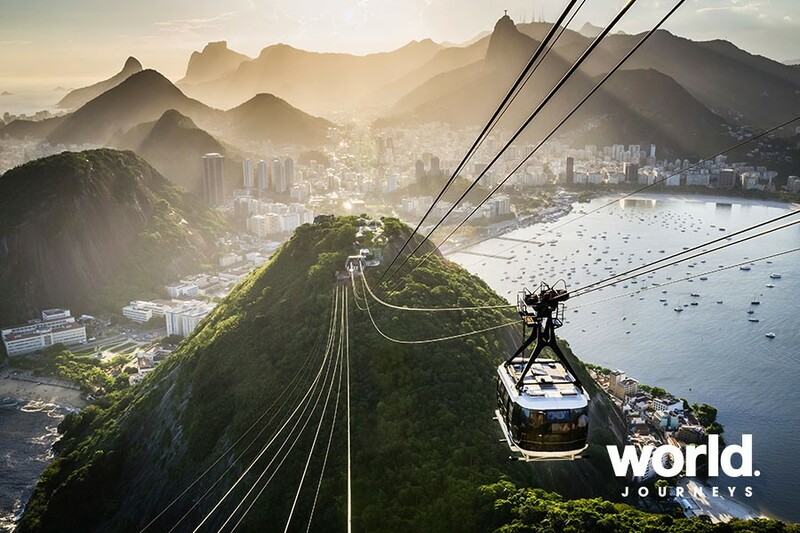 Day 7: Rio de Janeiro Enjoy a full day private sightseeing tour of this wonderful city. 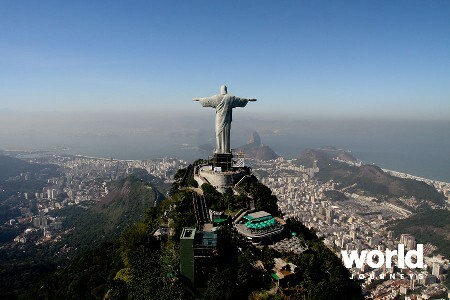 Visit the famous 'Statue of Christ' sitting atop Corcovado and admire the sensational views. Later visit the top of Sugarloaf and see the famous beaches of Copacabana, Ipanema and Leblon. A memorable day. 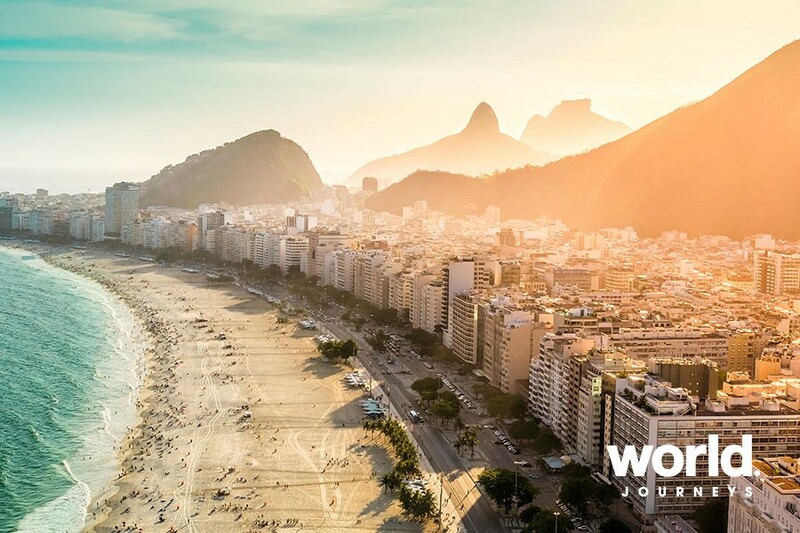 Day 8: Rio de Janeiro Day at leisure to enjoy a swim at one of the iconic beaches or perhaps shop in the fashionable boutiques at Ipanema. Day 9: Rio de Janeiro > Lima Morning at leisure before transferring to the airport to fly via Sao Paulo to Lima. On arrival transfer to your hotel situated in the stylish suburb of Miraflores. Day 10: Lima Enjoy a full day sightseeing in this historic city, including the wonderful Larco Herrera Museum, considered by many to have the best collection of Inca and pre-Inca artefacts and weavings in the world. Day 11: Lima > Sacred Valley Of The Incas A short flight to Cuzco and then transfer to the beautiful Urubamba Valley, best known as the 'Sacred Valley of the Incas.' 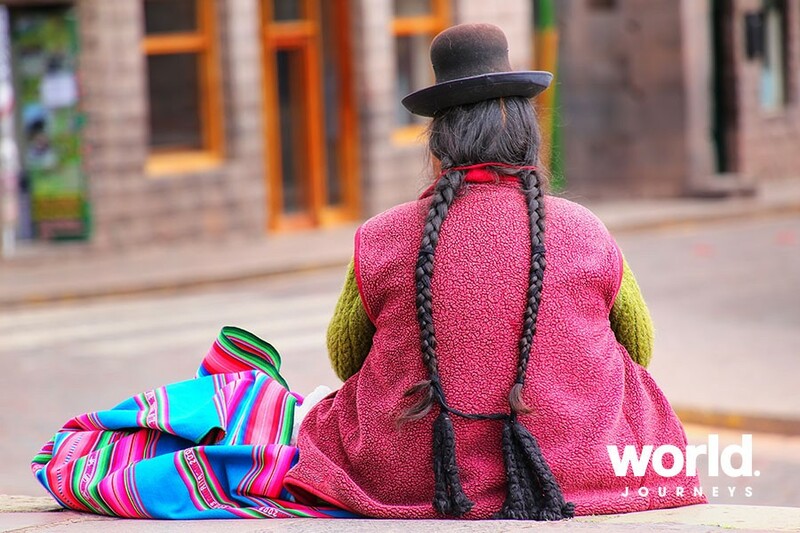 En-route from Cuzco to your hotel you will visit the famous market town of Pisac. Days 12: Sacred Valley Of The Incas A full day of sightseeing includes the ingenious Inca botanical experiment at Moray, the amazing salt mines of Maras and the incredible fortress at Ollantaytambo, scene of the last great battle between the Spanish Conquistadors and the Inca armies. Day 13: Sacred Valley Of The Incas > Machu Picchu Travel on a very scenic 90 minute train journey from the Sacred Valley of the Incas to spend overnight in Aguas Calientes, the town at the foot of the mountain on which Machu Picchu sits. Spend some time exploring the markets this afternoon. Day 14: Machu Picchu > Cuzco Transfer to the ruins and enjoy a guided sightseeing tour of this amazing 'Lost City of the Incas'. Lunch will be included at a restaurant situated very close to the ruins. Later in the afternoon, return by train to Cuzco. 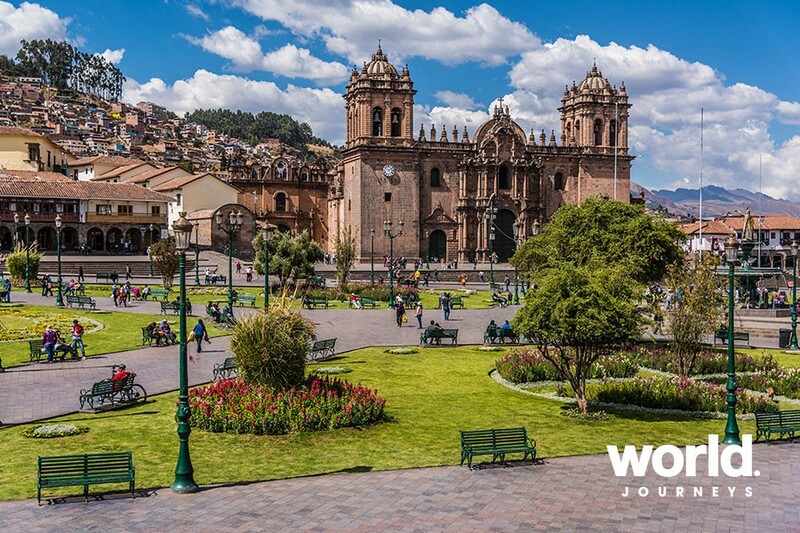 Day 15: Cuzco Enjoy a tour of historic Cuzco including the amazing Inca Temple of the Sun, the Inca fortress of Sacsayhuaman and the beautiful Cuzco Cathedral. Day 16: Cuzco A day free to explore the shops and markets of Cuzco and soak up the wonderful history in what was the 'centre of the world' for the Inca. Day 17: Cuzco > Puno An interesting day travelling by road to Lake Titicaca with stops at Andean villages and the fascinating ruins at Raqch'i which has in addition to an excellent local market, over 200 circular storehouses dating from the Inca times. 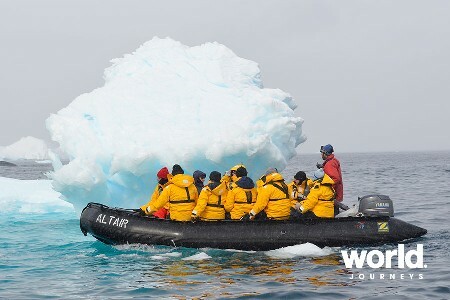 Day 18: Lake Titicaca Discover two of Lake Titicaca's famous islands. 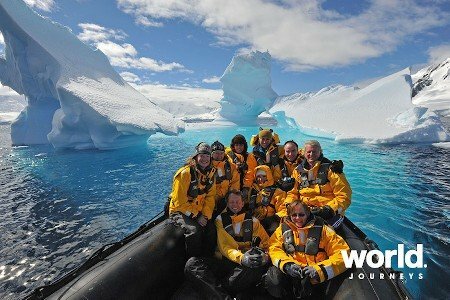 Taquile Island, where knitting is performed exclusively by males,starting at the age of eight while the women make yarn and weave. 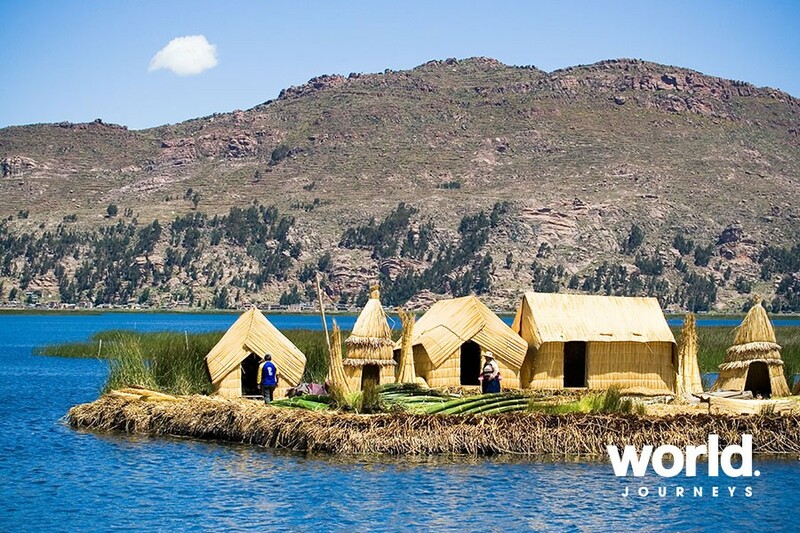 Visit the Uros floating islands which are made from tortora rushes and the people predate the Incas. Day 19: Lake Titicaca > Lima Transfer to Juliaca Airport with a stop at the ancient gravesite at Sillustani, famous for it's impressive funerary towers which reach up to 12 metres in height. Fly to Lima and overnight at an airport hotel. Day 20: Lima Depart Lima. Extensions are available to other parts of South America including the Galapagos Islands. Some price variation occurs due to Easter, Christmas, national or religious holidays. The price is based on flying into South America on LATAM. If arriving on another airline please enquire for revised pricing.